The SCC is a scientific estimate of the anticipated costs of a wide variety of climate change impacts such as coastal erosion, declining agriculture, increased disease rates, etc. It boils down a vast amount of scientific and economic research into one number that best represents the future costs of emitting CO2 now. Today, that number is $45/mT CO2, but it will rise each year due to the fact that delays in responding will likely lead to more severe damages. In 2009, the Obama Administration created a nonpartisan Interagency Working Group (IWG) including the EPA, DOE and ten other agencies to develop and maintain the SCC. Since then the SCC has been important in the development of over 100 regulations such as vehicle fuel efficiency, pollution from coal-fired power plants, and energy efficiency standards for home appliances. Although Trump’s EO claims that agencies will continue to use “the best available science and economics”, it is actually a huge step backwards. It will disband the IWG, limiting future updates to the SCC, and it directs agencies to comply with OMB’s 2003 guidance on regulatory impact analysis — back when not much attention was given to carbon emissions. There are two other ways this administration might try to lower the SCC and, consequently, the value we place on the health of future generations and our environment. First it can change what is called the “discount rate”, which is kind of like a reverse interest rate. The higher the discount rate, the lower the value we place on the future. The SCC currently offers a range of discount rates, from 2.5% to 5%, and generally uses a “central” rate of 3%. Trump’s EO proposes a rate of 7%, which assumes staggering economic growth in coming years. This is basically saying “Screw the future!”, especially since climate change is making it less and less likely the economy will continue to grow at current rates. The second tweak involves the geographic extent of the calculation. While the SCC currently takes into account global costs and benefits to CO2 emissions (because climate change is a global problem! ), it is likely that this scope will be narrowed to just the U.S., which would fit well with Trump’s “America first” nationalistic rhetoric. 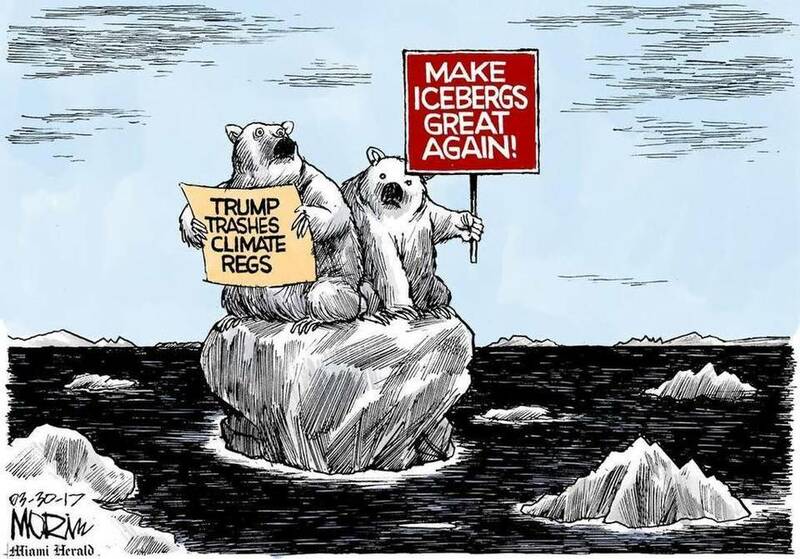 This would result in further isolation from the global community of climate scientists and further delay in any real U.S. response to global warming. 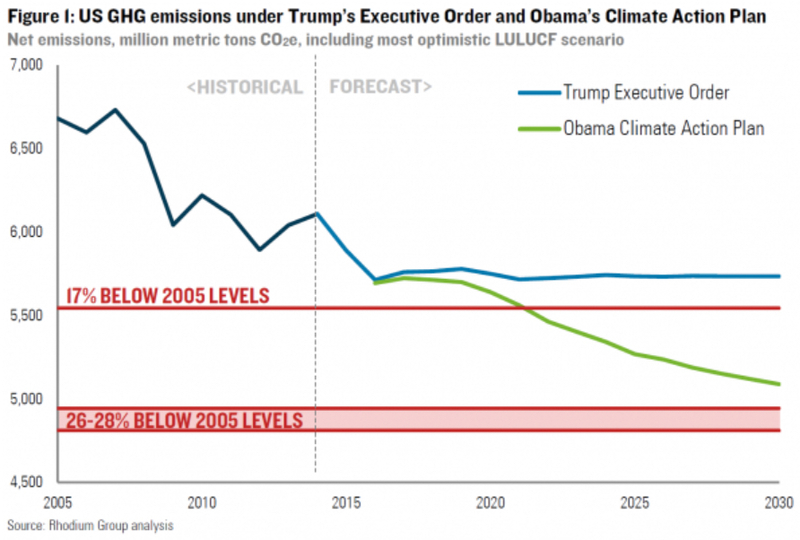 According to the Rhodium Group, if Trump’s EO were fully implemented, not only would we miss the Paris commitment of reducing CO2 emissions 16-28% below 2005 levels by 2025 (which we would also likely miss even under Obama’s Climate Action Plan), we would also miss the Copenhagen Accord commitment of 17% below 2005 levels by 2020. And, of course, neither of these commitments are even close to what is considered necessary to prevent global warming from shooting past the 2°C threshold that scientists fear will risk even greater catastrophes. If there is a silver lining to any of this it is that Trump will not be able to eliminate the SCC completely and there will be massive legal resistance to any attempt to roll back EPA climate regulations. In 2007, the SCOTUS ruled that greenhouse gases qualify as a pollutant that can be regulated by the EPA under the Clean Air Act and in 2009 the EPA announced that CO2 poses real harm to the public. Abandoning basic climate science will be met with increasing litigation and mobilization, such as the massive climate march planned on April 29th. Earth Deeds will continue to rely on the SCC determined by Obama’s IWG and we hope it will continue to evolve with the best scientific data available. More than ever, we can’t wait for government to fix things and need to work together to create a healthy world for future generations and all life.